You can not benchmark a keyboard. When it comes to purchasing a keyboard, especially an ergonomic one, people are looking for comfort. Sure, price and fancy buttons may play a role, but it all falls back to the feel of the keyboard. This is where Microsoft Natural keyboards excel. Naturals have always had, as their name would suggest, a more natural feel over regular keyboards. Microsoft's latest edition to their Natural line, the Natural Elite 4000, takes comfort to an entirely new level. I'll start with the two revolutionary changes Microsoft implemented in the Natural 4000. 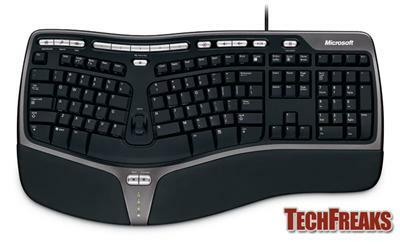 The first is the keyboard's "gull wing" design-the middle of the keyboard is elevated higher than the sides. The second thing is the gable, that has the keyboard slanted downward at a 7° angle. (See the picture for clarification) Instead of wresting your hands against a desk and bending your wrists upwards (like you would on normal keyboards), the Natural 4000 allows you to wrest your wrists on the foam padded wrist-wrests (which are a very nice touch) and your hands fall in place. This new arrangement takes a couple hours to become accustomed to, but everything after those initial hours is pure typing bliss. 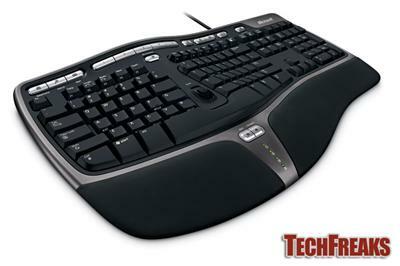 My previous keyboard was the Microsoft Natural Multimedia Keyboard, which was nice, but the multimedia buttons stuck out from the overall design/curvature of the QWERTY layout. The Natural 4000's "multimedia buttons" are better integrated into the 4000's design and allow the user a bit more customization. The Natural 4000 has the standard Home Page, Search, E-Mail, Calculator and Audio Control launch buttons along with five "My Favorite" buttons. Along with these feature buttons is a zoom bar located between the split of the left and right sides of the keyboard and "Back" and "Forward" buttons located between the split of the wrist-rests. The zoom button only works in most applications, but does not work in any of the Adobe Creative Suite 2 programs (Photoshop, Illustrator, etc.). All of the "feature" buttons can be programmed to do anything through Microsoft's IntelliType Pro; I don't use any of the buttons regularly, so I left them alone. Simply put, this is the best keyboard I've ever used. The feel of the Natural 4000 is unrivaled. The keys are very quiet, the padded wrist-wrests are a great added touch and the gull wing and gable design is truly revolutionary. This far into the review, I'd be handing out ideas on how to make the Natural 4000 better, but I'm stumped. Microsoft really hit the nail on the head with the Natural 4000 and I can't find anything I'm dissatisfied with. The price is a bit steep, as it retails for around $50, but even then, the additional comfort is well worth the price.